What is an ordered pair ? Definition and examples. 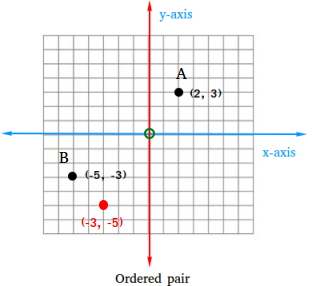 An ordered pair is a set of two numbers that identifies the location of a point on a coordinate plane. There are three ordered pairs on the coordinate plane below. The ordered pair (2, 3) is the location of point A. To get to that location, start where you see the small green circle. Then, move 2 units to the right and 3 units upward. The ordered pair (-5, -3) is the location of point B. To get to that location, start where you see the small green circle. Then, move 5 units to the left and 3 units downward. It is not for no reason we say "ordered." Notice how the order of the numbers in the ordered pair makes a difference in the location of the point. For example, (-5, -3) is a different location than (-3, -5)!